Paul McCartney's early solo work is such a weird mix of different styles. It makes for some great, great records. Unfortunately, I've only got a few of 'em. I could have sworn I had his first solo album, but I must have been making that up. It's nowhere. The important thing is, I do have this one. And it's good. Paul's always good for a solid opener, and needless to say, "Too Many People" - whether you believe it's a rock & roll diss track or not - is an awesome song. The springy acoustic intro, the rolling bass line (duh), the falsetto - it's all fantastic. "3 Legs" is a fun blues number, and "Ram On" is just wacky enough to work. Of course, it's all lead-up to the combo of "Dear Boy," "Uncle Albert/Admiral Halsey," and the sweet Beatle-ness of "Smile Away." The second side keeps it coming: "Heart of the Country" is acoustic and a little bit fancier than it lets on. And Paul's vocals sound great. "Monkberry Moon Delight" isn't quite as nutty as its title, but the prominent background vocals make sure it stands out regardless. "Eat at Home" is a mix of classic rock and 50's rock, something that McCartney's great at. At this point you should be used to Linda singing in the background. Thought it may not prepare you for her vocals on "Long Haired Lady." I'll leave it at that. "The Back Seat of My Car" sounds like it belongs on a Wings album, though it's not quite that syrupy, I suppose. What can I say? Paul's my favorite Beatle. Re-listening to an album like this doesn't dissuade me from that opinion. This record, especially, is when Paul was happy, but still holding onto some of his pissiness left over from the split of the Beatles. Great era for him. Most people point to his first solo as being his superior album (it's really not) but "Ram" is really where it's at. I love this album so much that I honestly don't understand how it is so underappreciated. If you can get over Linda singing backups (which actually adds to the homemade charm for me) then there is really not a bad spot on this record. This album got bad reviews when it came out and I attribute that to one simple thing: The decision to credit the album as Paul and Linda McCartney. For people still bitter over the Beatles break up I am sure this was just too annoying to bear. "Too Many People," "Uncle Albert," "Dear Boy," "The Backseat Of My Car," and "Heart Of The Country" are all pretty much perfect songs. Here's an odd thing. 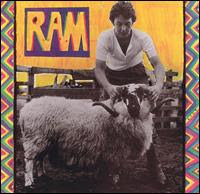 McCartney followed this (what I consider to be his finest post-Beatles album) with his worst album, Wings' "Wild Life." In the span of about 9 months. How does that happen?